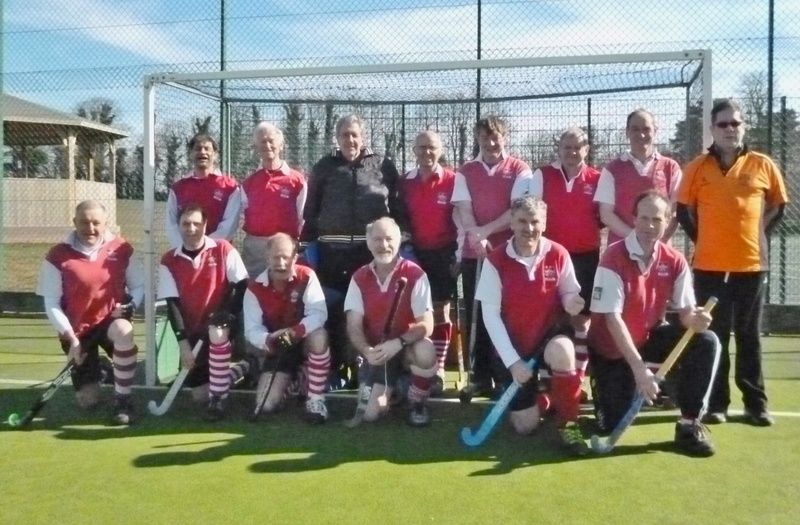 For many years Sutton Valence and Canterbury Vets have competed for a trophy playing the best of three games each year, but Canterbury’s entry into the Kent League has made it difficult to arrange games. It was a great pleasure for Valence to host the first game between the two teams in over two years. Canterbury started impressively and it was some minutes before Valence had a touch of the ball. However, as things settled down, it became apparent that the game was being contested between two well-matched teams, although it seemed that the fast-moving Canterbury forwards were going to prove a handful for the Valence defence. Valence had the better opportunities to score in the early stages. Their efforts were eventually rewarded when Roger Fermor, running onto a perfectly judged pass into the dee from Nigel Bardsley, slipped the ball past the Canterbury keeper to put Valence one up. Canterbury reacted to this setback by putting sustained pressure on the Valence defence, and there was a feeling of inevitability for the spectators, when only a few minutes later, this culminated in a goal from a short corner to level the scores at 1-1. Valence retaliated with enthusiasm, creating several good opportunities but sadly not finishing them off. This dominant period of play finally resulted in a well-struck Rupert Humphrey short corner finding the back board to put Sutton Valence ahead again at 2-1. Canterbury continued to pressure Valence, but the defence of McVarish, Nettle, Harrison and stand-in keeper Julian Mills held firm to leave Valence ahead at half-time, but generally disappointed at the many chances that had been missed during the half. In the second half, the excellent interval refreshments (courtesy Charles Worsfold) seemed to have adversely affected the home team, but invigorated the Canterbury players, and it was not very long before they had levelled the scores with a goal past the a static and confused Valence defence, 2-2. Although the Valence midfield of Bardsley, Dinnis and Sagrott were now creating good opportunities for their forwards, Canterbury were starting to look the better organised team. Several good scoring opportunities were created but squandered, fortunately for Valence. However, it was no surprise when Canterbury scored their third goal, albeit a rather fortunate one, in that it resulted from two deflections in the dee from an opportunistic strike from outside. At 2-3, Valence were now shocked to be behind after such a good first half. They renewed their efforts with Dinnis enjoying some penetrating runs into the Canterbury half, but without success. The minutes continued to tick by and with all looking lost, a short corner was won in the last minutes of the game. The ball came out to Dinnis and, at his second attempt, his shot beat the keeper to save the day for Valence, making the final score 3-3. It was a splendid game played in good spirit with the draw reflecting the balance of play, but Sutton Valence were able to retain the trophy on the basis of their being the previous holders. Match Report by Nick Willson.